Featured in DCCA's 2018-2019 Family Theatre Series is Mermaid Theatre of Nova Scotia’s glowing production of Rainbow Fish, based on the classic children’s book, on Sunday, February 10th at St. Clair Memorial Hall starting at 2 p.m.
Darke County Center for the Arts recognizes The Jean Louise Thieme Children’s Theatre Fund of the Darke County Foundation and for their support of DCCA’s Family Theatre Series. “DCCA is pleased to receive continual generous support from community organizations such as The Jean Louise Thieme Children’s Theatre Fund of the Darke County Foundation. With their assistance we are able to fulfill our mission of cultural enrichment for the community,” stated Andrea Jordan, DCCA Executive Director. Jean Louise Thieme started DCCA’s Family Theatre Series, in 1997; this series provides young children, their parents, grandparents & great grandparents the opportunity to enjoy professional live theater in Memorial Hall. Productions in the 2018-2019 season include the recent comedic juggling performance of Playing By Air on November 18. 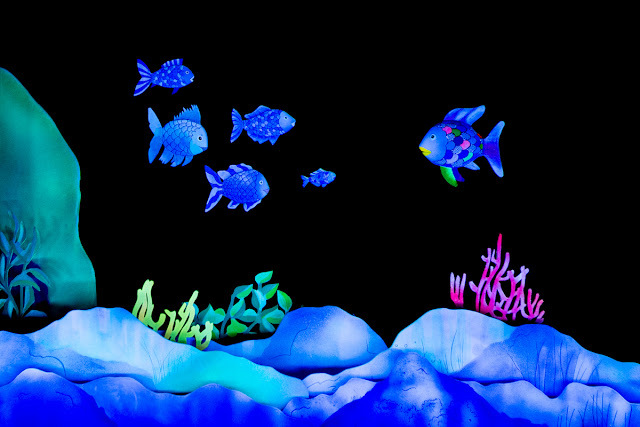 Mermaid Theatre of Nova Scotia’s glowing production of Rainbow Fish, based on the classic children’s book, on Sunday, February 10, and on Sunday, April 7 Underneath a Magical Moon from Tutti Fruitti Productions, a re-imagining of the Peter Pan tale as it would be told by Wendy. Additional sponsors for DCCA’s Family Theatre Series include Dayton Power & Light Company Foundation, Second National Bank, Greenville Federal, Greyson James Steyer Fund of the Darke County Foundation, Edison State Community College, Gordon Orthodontics, Jordan Insurance Agency, Wayne HealthCare, Greenville Rotary Club, Wes & Patti Jetter, and Family Health. The series also receives support from DCCA memberships. The Ohio Arts Council, John R. and Miriam H. Knick Fund, Harry D. and Esther Stephens Memorial, Ketrow Foundation, and Lydia Schaurer Memorial also provide operating support for DCCA. For more information on DCCA, the and the 2018-2019 CELEBRATING 40 YEARS season or to purchase tickets for an upcoming event, contact the DCCA office at (937) 547-0908 or visit us online at www.DarkeCountyArts.org.